Which came first, the Wright—a type begging for an interlocking crafting subsystem to support their play—or a salvaging and crafting system crying out for a character type custom designed to use it? It might seem like the former, but it’s actually the latter. 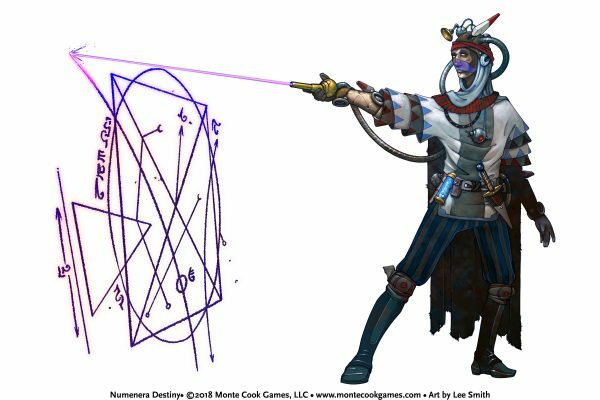 The truth is, any character can craft numenera devices if they have a plan and the right components. In the same way that the Glaive being best at fighting doesn’t preclude other types from fighting, the Wright being the best crafter doesn’t mean other characters can’t attempt to build numenera devices. To make things, a crafter needs ingredients. And to make really weird things, like numenera devices and structures, a crafter needs especially impressive ingredients. So we built a list of exotic components that could be used to craft devices that give a character the ability to levitate, tap into the datasphere, or increase their density by an order of magnitude. Components like responsive synth, kaon dots, oraculum, midnight stone, and cosmic foam. Narrowing my eyes with the effort of my rapid thinking, I finally blurted out, “Iotum?” The presentation started. Monte called the special components iotum, and so they’ve been called since. Iotum’s introduction as a concept proved a happy coincidence. PCs were already scouring the ruins of the prior worlds looking for treasure. The introduction of iotum gives every PC countless additional reasons to head into those ruins, because almost every kind of iotum is a micro-treasure in itself. Take quantium, for example, which is a kind of iotum usually found as synth boxes glinting with tiny points of light. In addition to being a needful crafting material, quantium can be used to attempt to move the character one round back in time. 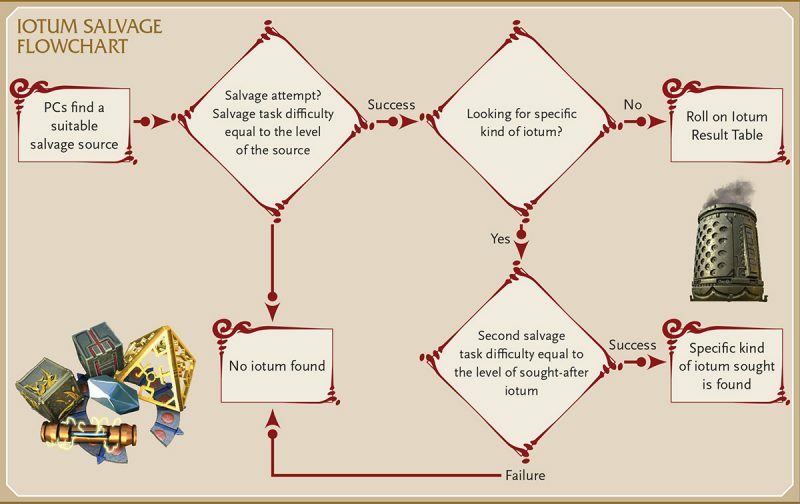 As is true of most of our game design, the system for salvaging iotum went through several drafts. For something seemingly as simple in concept as finding stuff, it took time to create a system that was simple enough to be used, but not so simple that it could be abused. We refined this system a little bit after each and every playtest. Finally, even as the books were heading into proofing, we decided to add a flow-chart, which crystallizes the true simplicity of the system in a way that anyone can appreciate. We wanted to make a cohesive crafting system, but realized that crafting numenera was a whole lot different than crafting commonplace objects and structures like canoes or wooden palisades. Iotum, noted above, is vital, but so is having a plan on how to put it all together. On the first conceptual go-around, plans were imagined to be things that characters might find as fully-formed blueprints in the ruins of the prior world. But after only a little bit of additional thought and play, we realized that just didn’t sit right. Sure, PCs might find the seeds of crazy ideas for building numenera, but finding fully realized plans for an object built long ago by an unimaginably advanced alien mind goes against the entire esthetic of the setting. So, we decided that the plans characters use are actually developed by the characters themselves. Which means that a character uses components that they barely understand, in a way that is probably not how they were originally intended, to create a device that does what the character wants it to do, even if they don’t know exactly why. 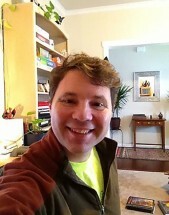 They just know if they use this plan to put together the iotum and parts in such and such a way, the object or structure they were hoping to create eventually takes form. 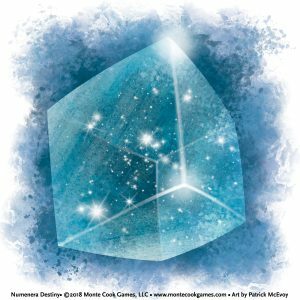 Keep on top of all our behind-the-scenes Numenera Discovery and Numenera Destiny content by subscribing to our website. Simply scroll to the top of this page and enter your email in the box on the right. You won’t want to miss these first looks at new character options, rules for building and supporting communities, and much more! 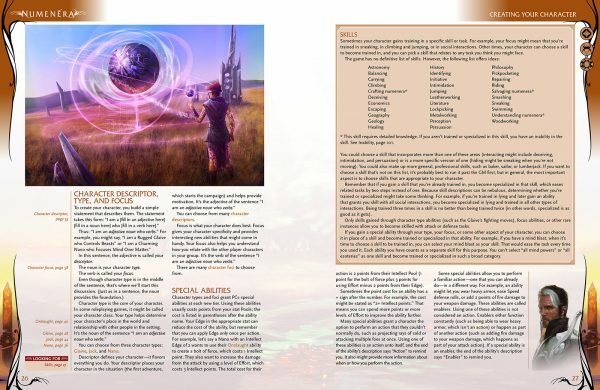 Download a free preview of Numenera Discovery and Numenera Destiny! Preorder and get the PDFs free! This entry was posted in Articles & News, Design Diaries, Design Lab and tagged Game Design, Numenera.